Treadmills try to keep you in place physically, they are not really good at sensing where you are. In contrast, the tiles concept above is actually working around you as it has to understand where you are going. It is a real interface between the virtual environment (as it has to know what comes next) and your movements (and thus has to track you decently). It may be clumsy (what if the person is running?) and inefficient right now, but in my eyes, it has all the potential to make you feel running as you like and feeling the environment. it has to become faster, maybe even smaller then. possibly the plates have to tilt in directions to emulate environments better (going up a hill). I would love to see this concept advancing. That said, I’m still in love with the bionic chair by Govert Flint as it would work in constrained spaces, i.e. for consumer use. This entry was posted in virtual reality on 21. December 2018 by ramin assadollahi. 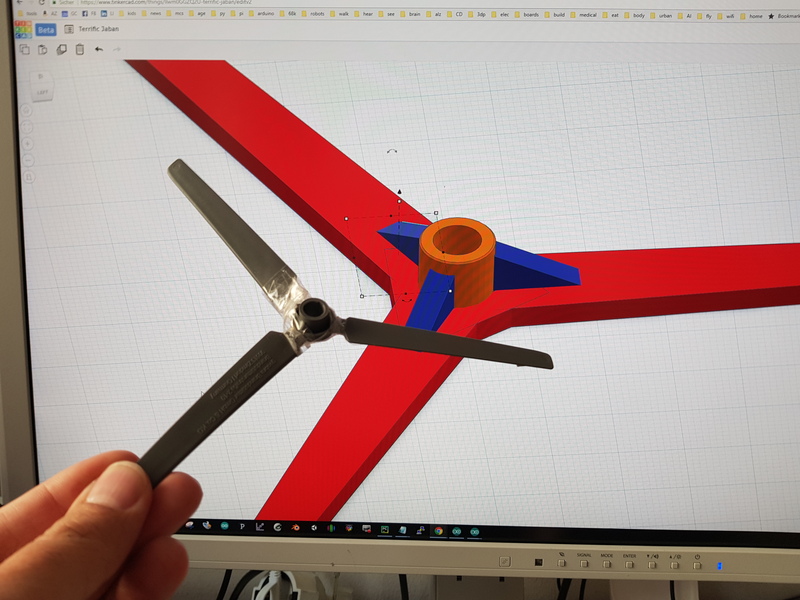 The rotorblades couldn’t resist my kids, so there was the job to 3d print them. 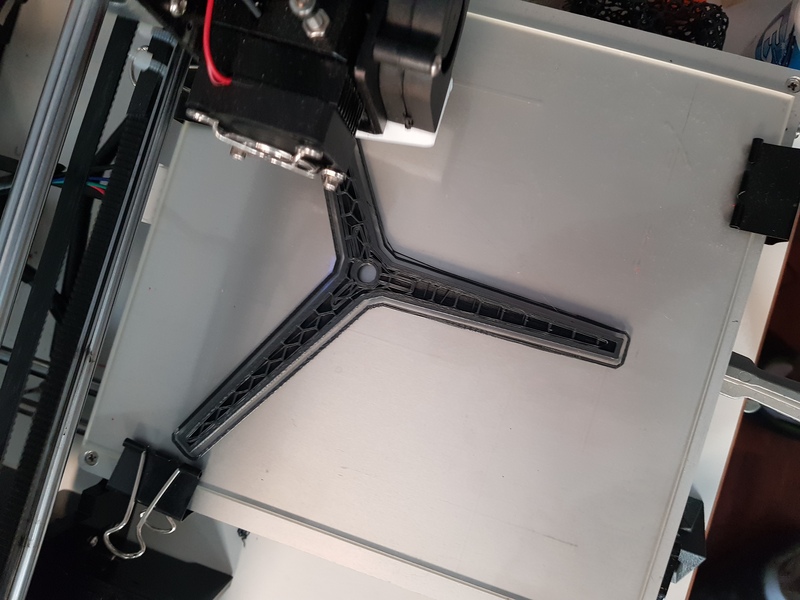 I did this in 40min in Tinkercad, I certainly did the connection of the blades in a different manner than the original, you see that the blades are connected even around the shaft. 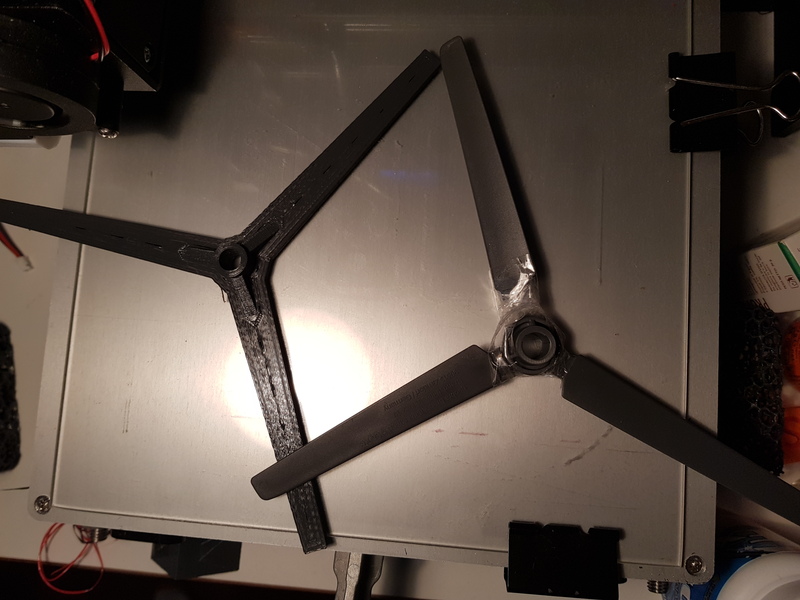 I also added those blue supports that should give additional strength. In the back you see the rendered gcode file in Simplify3d. Nice One and a half hour repair! 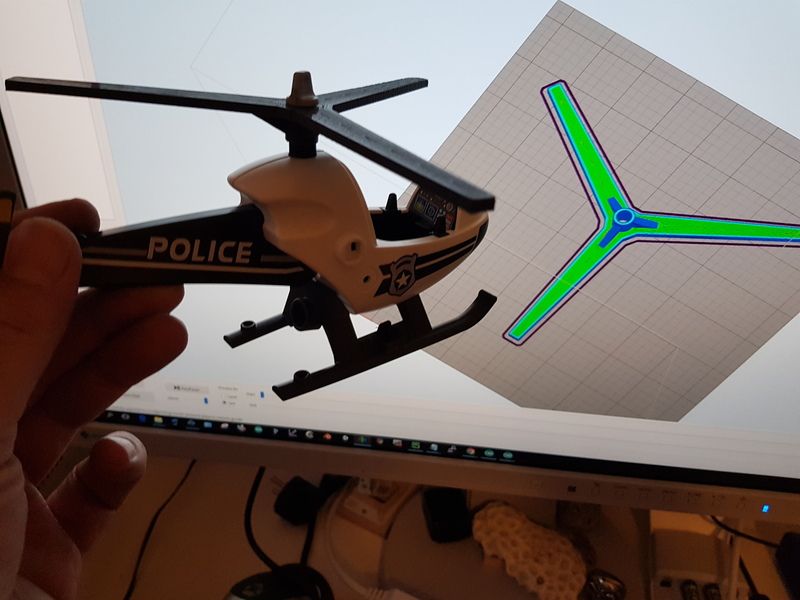 This entry was posted in 3d print on 6. August 2017 by ramin assadollahi. 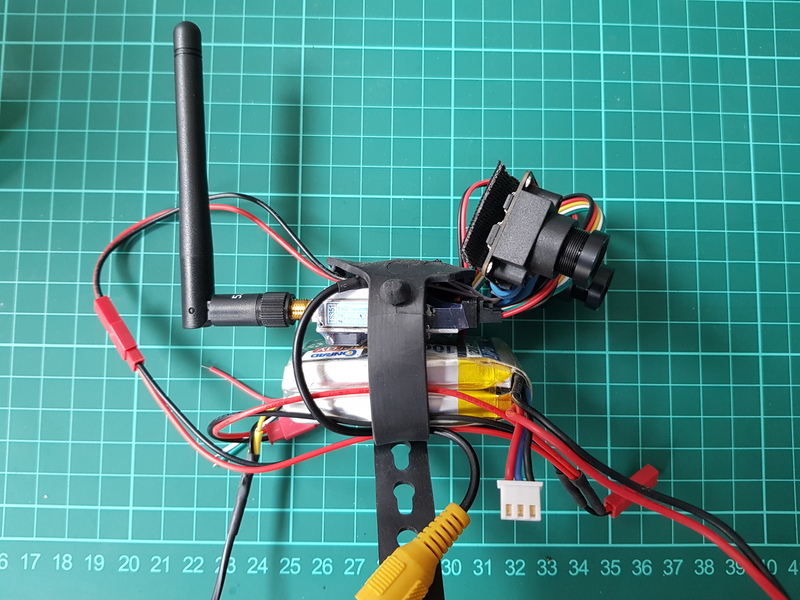 With the recent progress of running Oculus Rift from a Pi 3 and the experiments of streaming video from the stereo cam Blackbird 2, I thought it was a great idea to attach the camera to the upper part of Trashbot and send the Oculus head orientation to the neck controlling Arduino Mini Pro. 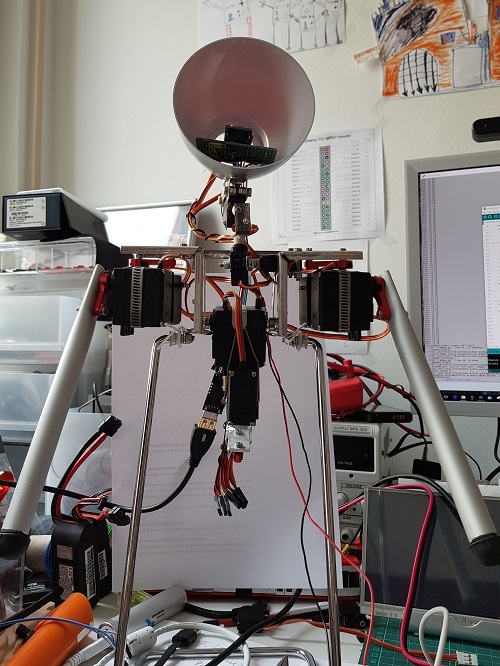 This entry was posted in arduino, robots, trashbot on 23. July 2017 by ramin assadollahi. 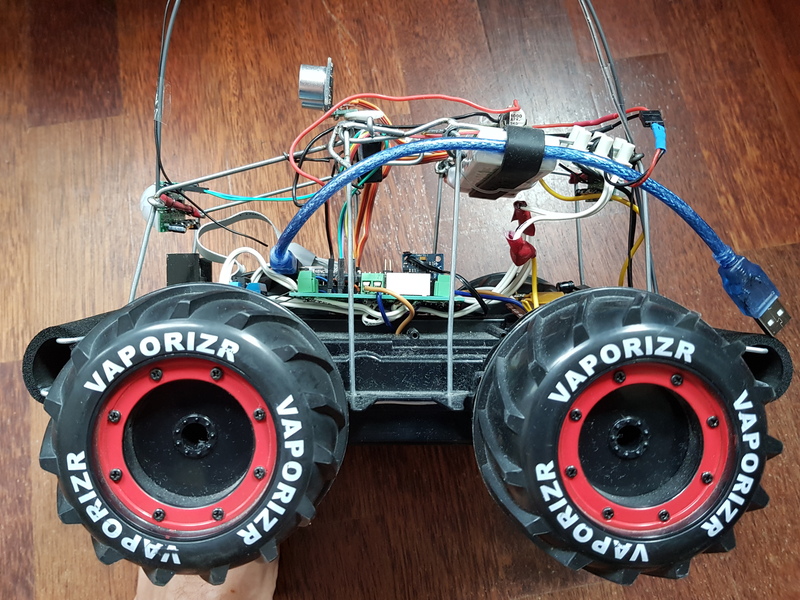 This entry was posted in raspberry pi, rover, virtual reality on 22. July 2017 by ramin assadollahi. I have two stereoscopic cameras. The Minoru which is “kind of” a cheap camera at about 70€, but then again: not, because it’s just 2x 640×480 resolution… I stripped the camera to reduce its size, weight an volume to actually use it on the Trashbot since I know that it is supported by the Raspbian as a camera. 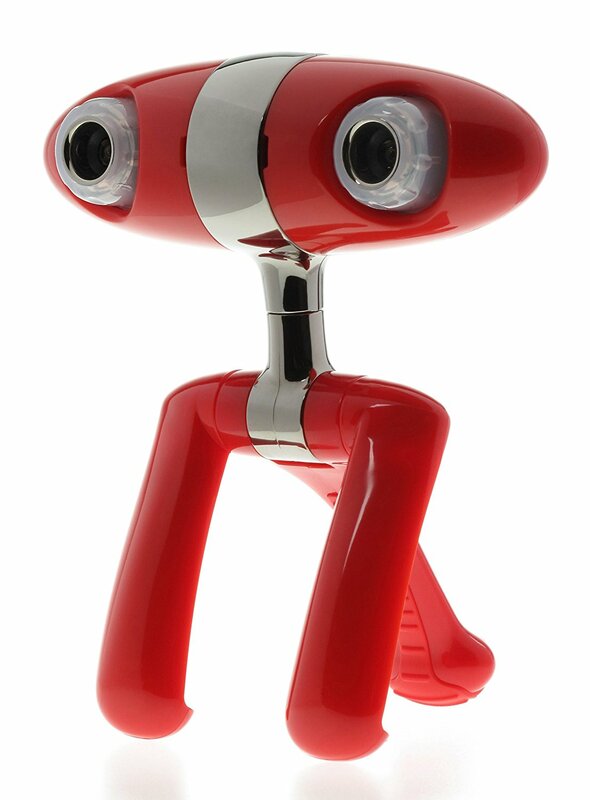 I also experimented already with the Blackbird 2, an analog camera for streaming video from drones to video goggles. However, that attempt was not really successful since the camera software on PC (!) was laggy and I was thinking that it may be due to the video capture card Easycap (10-20€). Learning: the 190€ combo beats the other two BY FAR in experience. PS: In the video, you see that I attached the cameras to a different Pi than the one attached to the Oculus. 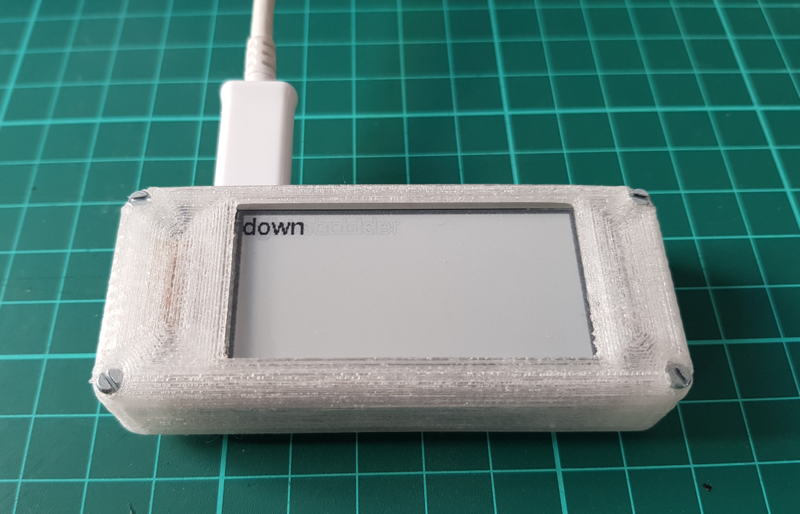 This is because, the Oculus Pi has display settings tuned towards the goggles and I need to invest time to make the config changeable via software to actually switch between the googles and a real external display. 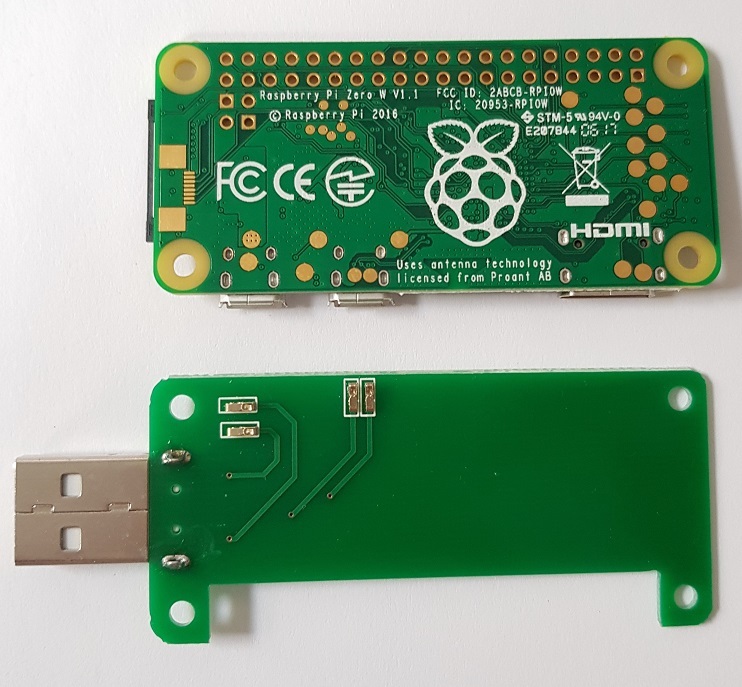 This entry was posted in raspberry pi, virtual reality on 11. July 2017 by ramin assadollahi. Oculus Pi untethered, pt. 2: a camera! 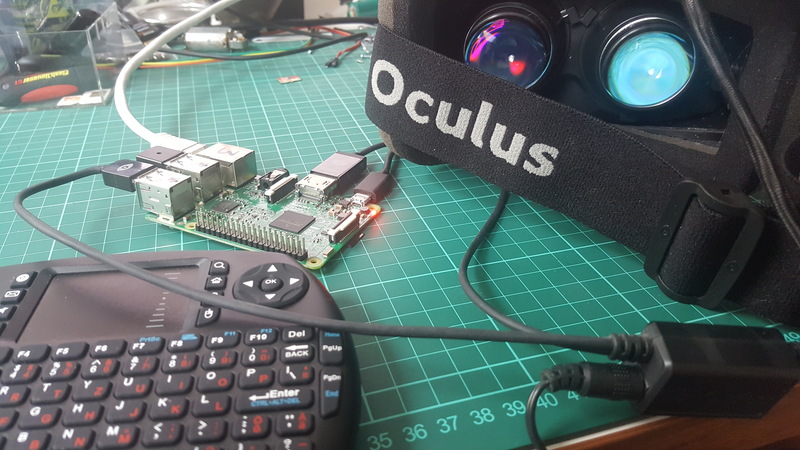 Last time, I was able to get the Oculus Rift DK2 to run on the Raspberry Pi 3, including the head tracking. However, the first interactions showed that it’s cumbersome to work with the desktop (since it’s not distributed on the two eyes but really is using the LCD as one screen) and also to use the keyboard. Also, in the context of making the Oculus mobile and untethered, it is necessary to have a camera onboard, at least, until I get the XTtion to work. 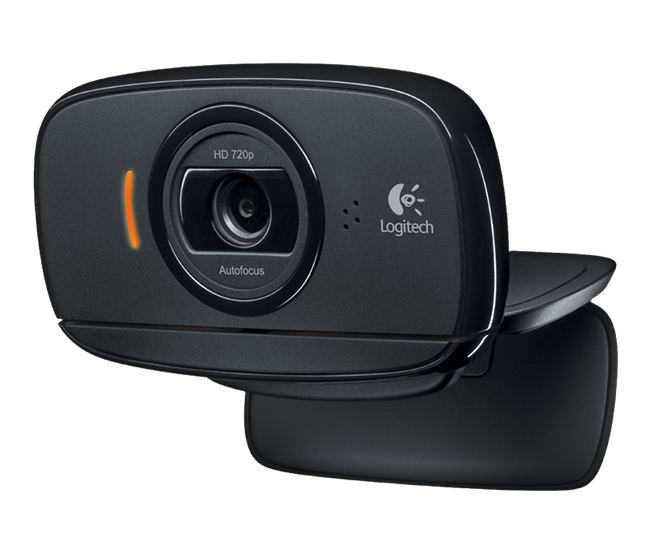 It is interesting that it is not too easy to find software that simply can display a video stream from a local webcam, most blogs just describe how to stream from a remote webcam or make a local USB cam accessible via some webservice. 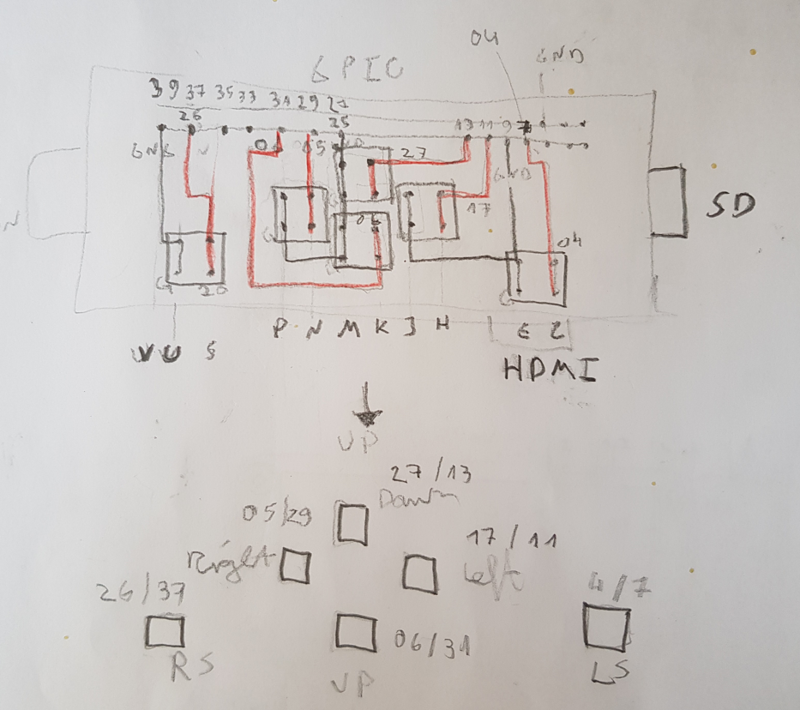 My last attempt to get a stereo analog cam to work was not really cool since the latencies on a PC plus some weird display software as an .exe were not the ideal setting to really improve things. cam fits nicely the cables of the Rift and enough space on the straps to lead cables. Next, I may try to either position the video on one eye, or even double the stream to both eyes. 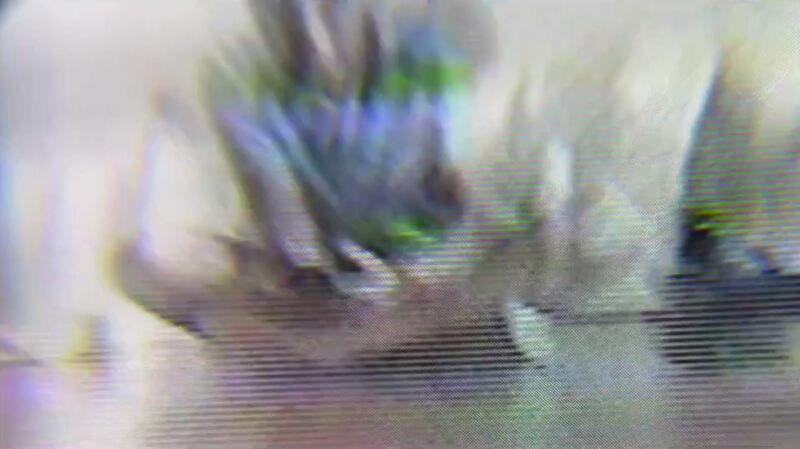 Or I may try to use the Minoru Stereo cam that I’ve been working on last year. 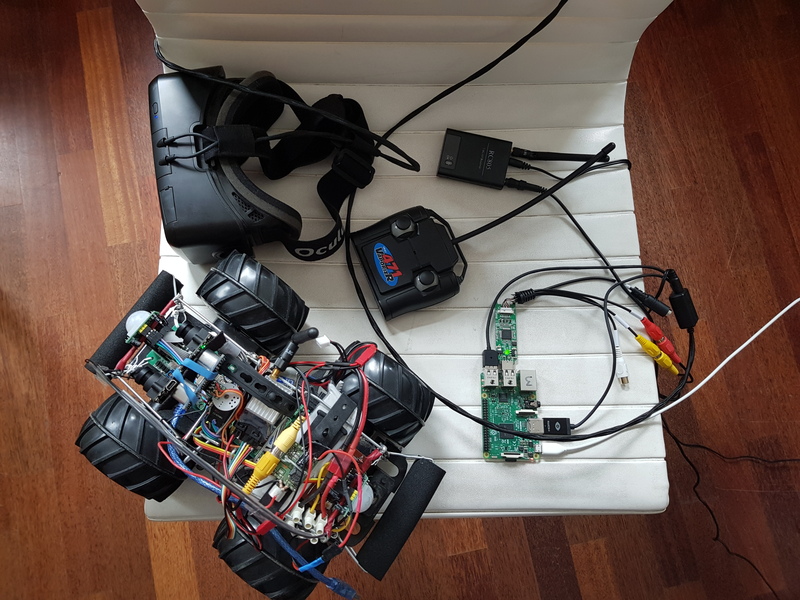 This entry was posted in raspberry pi, virtual reality on 9. July 2017 by ramin assadollahi. So after yesterday’s compile of the PointCloudLibrary that worked although I couldn’t install some of the files before, I compiled today OpenNI although I was not able to install g++-multilib (following Larry’s tutorial). Also, the installation worked (within seconds). Nextup was the installation of the Kinect driver / software package. Then it hailed errors. So, it seems that the g++-multilib is necessary for the SensorKinect package to compile. This will be an adventure to get somehow since it doesn’t seem to be available in Raspbian. Interestingly, I found in an older tutorial from 2013 the necessity to install g++, not g++-multilib. However, trying to install this just led to the message that I had the latest version already. In another old blog article, I found another version of this tutorial with an error similar to the one I got when calling make in the Build directory. And luckily, there was a reply by another visitor from May this year that there’s two files to change slightly to be able to compile it. I don’t quite understand what exactly has been changed there, but I’ll try out tomorrow to see whether this will work. 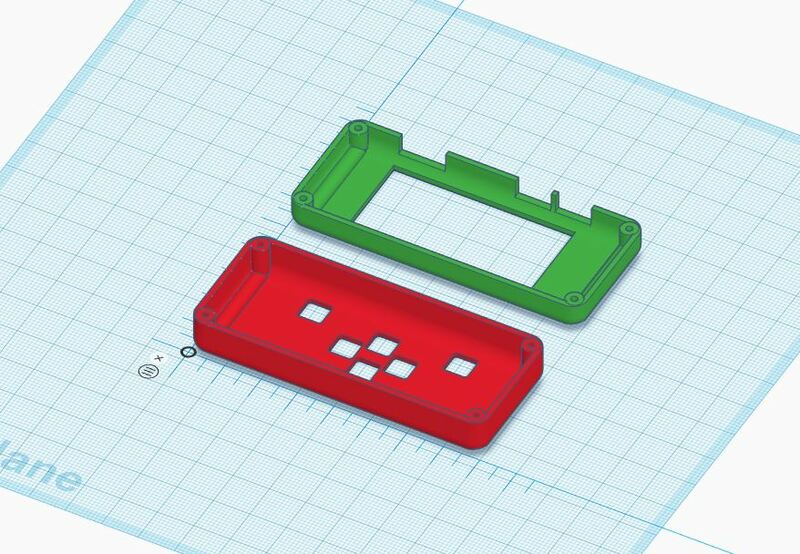 This entry was posted in 3d scan, raspberry pi on 29. June 2017 by ramin assadollahi. 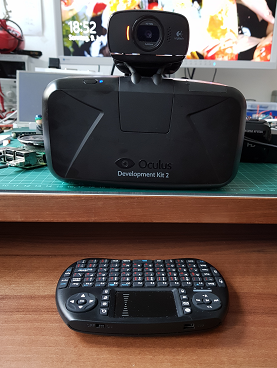 Recently, I managed to use the Oculus Rift as a display for the Pi 3 together with listening to the gyros via OpenHMD. And I found another instruction to run the XTion RGBd camera on the Pi 3 as well. For the sake of simplicity I set up a new system first and then will “fuse” the two. First prerequisite in Larry’s tutorial is to add decent swap space on the OS, his OS is Ubuntu, mine is Debian Jessie Pixel and that is done differently. So, on the default Raspberry OS, you change the size of the swapspace in the file /etc/dphys-swapfile where you change from 100MB to 2000MB here: CONF_SWAPSIZE=100. I love stackexchange for that… (after rebooting, the command free -h should show you 2.0 GB of swap space). Under Raspbian Jessie Pixel, I was not able to install libvtk (sudo apt-get install libvtk5.10-qt4 libvtk5.10 libvtk5-dev). Mono, QT and JDK seem quite heavy (like one GB of space) and I don’t know whether I really need these, I hope not, since I really want to code in python and don’t intend to use QT. I installed them anyways, just to get as close as the recipe would let me ( sudo apt-get install mono-complete and sudo apt-get install qt-sdk openjdk-8-jdk openjdk-8-jre). So I skipped this launchpad part, just to see how far I’ll get. My feeling was that I wasn’t apt-getting something afterwards (but actually git cloning), so maybe this has not an immediate effect, let’s see. git cloning of the PointCloudLib worked (after user and pwd for git). 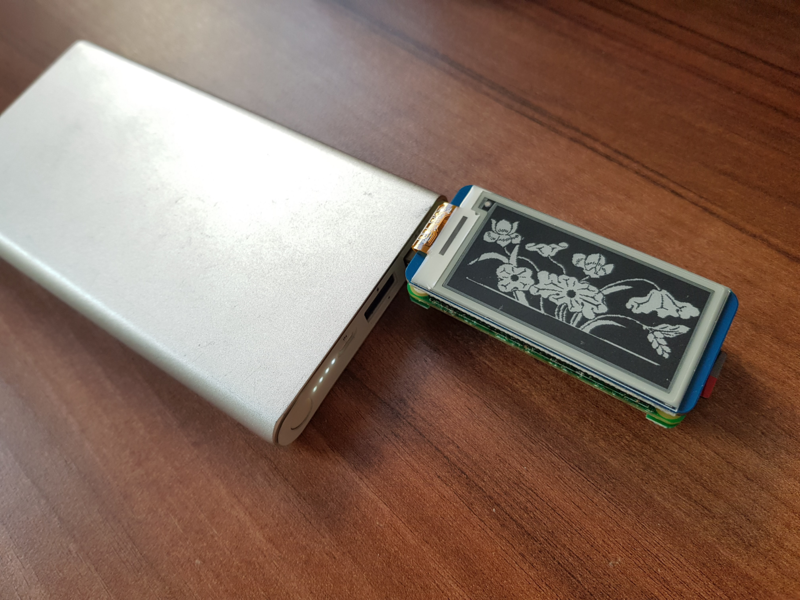 This entry was posted in 3d scan, raspberry pi on 28. June 2017 by ramin assadollahi. 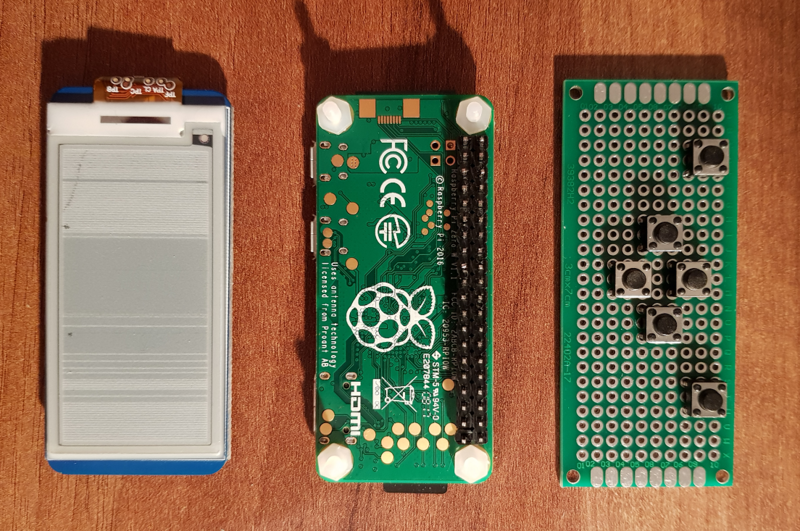 I’ve been long dreaming of connecting these to important technologies and run them in way that I actually understand. I’m not good at Android programming (for those cardbox VRs) and not really good at Unity (although that would be fun to dive deeper) and somehow my driver situation with the DK2 and windows 10 deteriorated. There have been earlier attempts to run the Oculus on a Pi, but in my eyes the latest iteration I found is the most fitting to me (including Python bindings and 3d libraries). 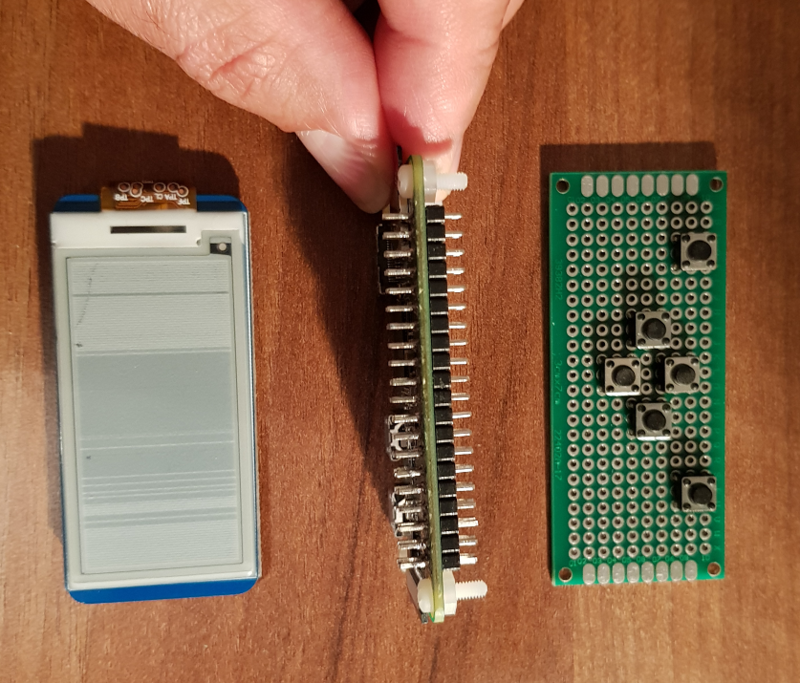 So recently, I came across Wayne Keenan’s blog how actually did exactly what I’m dreaming of, namely to run the DK2 controlled by the Pi3. I’m not so much interested in maximising the complexity of geometry in VR but really more in the interaction design and what untethered VR (or even AR) can actually feel like. This entry was posted in raspberry pi, virtual reality on 25. June 2017 by ramin assadollahi.